Melker Karlsson scored 3:22 into overtime giving the San Jose Sharks a 3-2 win over the Edmonton Oilers Wednesday night at Rogers Place. Oscar Klefbom opened the scoring at 6:44 of the first period, Milan Lucic recorded a goal and assist for a two-point night, Cam Talbot made 41 saves and Connor McDavid registered his first career playoff point with an assist in the loss. The Oilers finished the night 1-for-3 on the power play, 5-for-6 on the penalty kill and amassed only 19 shots on goal. It was a tepid beginning for Edmonton but Klefbom eased the nerves with the first Oilers playoff goal in 11 years. Lucic gained entry into the Sharks’ zone then dropped the puck for Jordan Eberle. Eberle, buying some time as he idled just within the blueline, waited until Klefbom was at the top of the left circle to feed him the puck. The defenceman fired a pass intended for Lucic that deflected off David Schlemko through the pads of Martin Jones and Rogers Place erupted in pandemonium. 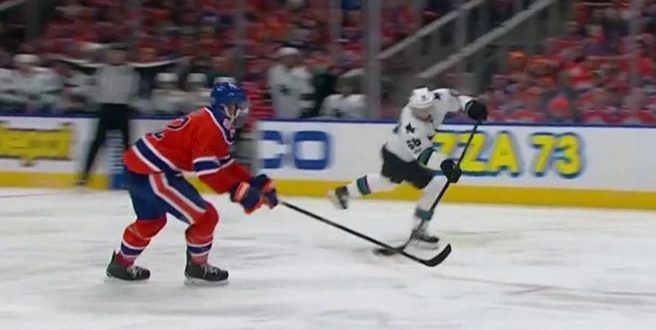 The Oilers killed two penalties – including one that saw Logan Couture rattle the crossbar – before scoring the next goal. Edmonton flexed their power play muscle on their first opportunity. A Mark Letestu one-timer kicked out to Lucic at the point. He took the vacant space in front of him and wired a wrist shot past Jones at 17:07. McDavid registered his first career playoff point on the play in feeding the puck to Letestu for the one-timer. Edmonton finished the period flawless on the power play and penalty kill, leading the hit count 21-18 and the score 2-0. Joel Ward sparked some life for the Sharks just 1:43 into the second period on the man advantage. As a Drake Caggiula hooking penalty was winding down, the Sharks winger tucked a goal crease feed under Talbot to cut the lead in half. “Four O-zone penalties in a row and they’re a savvy team – they’re a veteran team – they took advantage of it,” said McLellan. Talbot’s patience was tested not long after as the Sharks continued pressing. Brent Burns corralled the puck in front of Talbot, toe-dragged it around Kris Russell, then waited… waited… and waited for him to go down until he finally released a shot. The Oilers netminder stayed composed and spit the puck out with his right pad causing a raucous uproar from fans. Despite the Oilers only recording four shots in the period and down on the shot clock 19-14, they led the game 2-1 after 40 minutes. Edmonton had a chance to add to their lead in the first few minutes of the third frame. After killing a Caggiula high-sticking penalty that carried over from the second period, the forward was sprung on a breakaway. Just as he was about to release a wrister, his stick snapped in half. After getting lucky on Caggiula’s opportunity, the Sharked tied it up. Paul Martin scored at 5:22 of the final period while playing 4-on-4. With Patrick Maroon and Marc-Edouard Vlasic in the box, a rebound found Martin while Talbot was trapped at the post. The Sharks carried much of the momentum from the second period on, outshooting the Oilers 26-7. Edmonton got to overtime, though, thanks in large part to the superb goaltending of Talbot. Just over three minutes into the extra frame, Karlsson skated in on the left side of Talbot and let go a wrist shot that beat him far side. The Oilers will look to regroup Thursday to prepare for Game 2, which will be played Friday night at Rogers Place.